It is rare for a scientific paper to be the lead item on the evening news, or to fill the front pages of our national newspapers, but [that particular study]received exceptional worldwide media attention. Many different species of plants and animals have been moving higher in elevation and farther away from the equator to escape the Earth?s warming climate. Is economic ?graceful decline? the true agenda of some warmists? Sometimes the true agenda is laid bare. From http://www.eenews.net/climatewire/print/2011/08/19/1, a piece on Bill McKibben, in which E&E News? Paul Fialka discusses his agenda, are these passages. Many of the climate theories in [McKibben?s] book [“The End of Nature.”]? and the future career path of McKibben ? were shaped by James Hansen, who was then and is now the head of the NASA Goddard Institute for Space Studies in New York. Starting in 1988, Hansen had begun to testify before Congress that greenhouse gas emissions had begun to change familiar weather patterns on the planet and, without action to limit them, the changes would become more obvious and dangerous in the 21st century. In view of Perry’s current stance on AGW, is it a ruse to get things like this in the back door? Rick Perry may be good at invoking states rights and prop­erty rights, while dis­avowing ?for­eign cred­i­tors,? but his actions as Texas? longest serving gov­ernor tell a dif­ferent story. Public pri­vate part­ner­ships (or P3s) are part and parcel of the United Nations? Agenda 21. Two of the pur­poses of Agenda 21 are to abolish pri­vate prop­erty and restrict mobility and P3s act as the vehicle to do it. Perry made P3s a cen­ter­piece of his trans­porta­tion policy since he stepped in as governor. While Perry dis­tracted Texans and tea partiers with ?emer­gency? res­o­lu­tions on state sov­er­eignty during the 82nd leg­is­la­ture, P3s spread from trans­porta­tion projects to vir­tu­ally every other type of public infra­struc­ture in a bill, SB 1048, passed by the Texas leg­is­la­ture which he signed into law June 17. David Suzuki has never met, debated or even spoken with my colleague, scientist Willie Soon. But as more people dismiss Mr. Suzuki?s scare stories about global warming cataclysms, the more he has resorted to personal attacks against Mr. Soon and others who disagree with him. the local bear population decided to use it as a shithouse. So I think we can consign tree rings and the whole dodgy discipline of dendrochronology to the dustbin of climatological history. Read here. The IPCC’s climate models and its “consensus” of 97% of climate scientists have proven to be robustly wrong again. The prediction that global warming will cause an increase of storms with greater frequency does not hold up to empirical-based scrutiny. The Wall Street Journal reports that retractions of scientific papers have surged in recent years, with the top 3 journals issuing retractions being PNAS, Science and Nature. 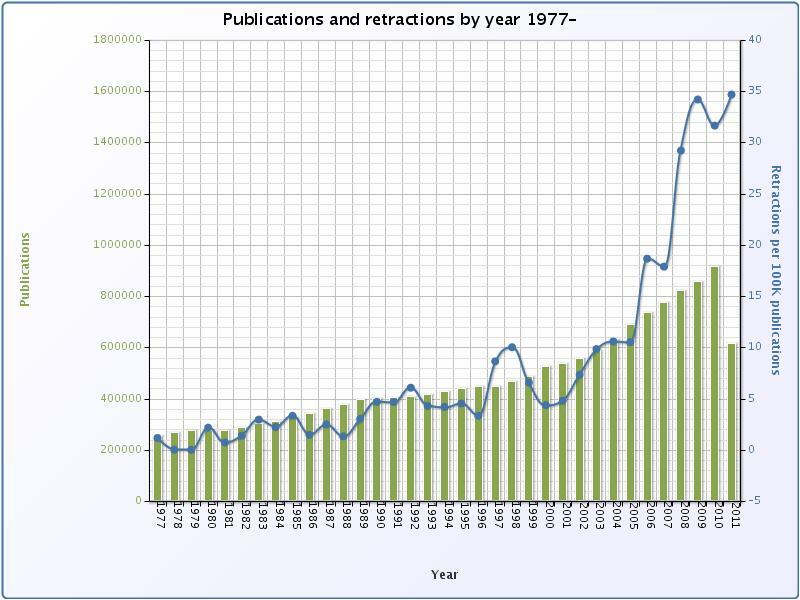 The graph above shows the increase in the rate of retracted papers. 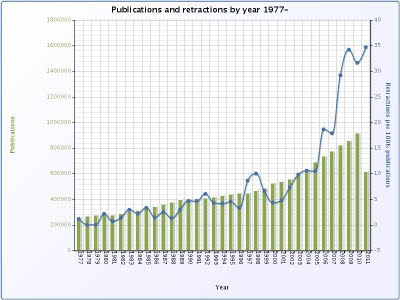 [T]here were just 22 retraction notices that appeared in journals 10 years ago, but 139 were published in 2006 and by last year, the number reached 339. Through July of this year, there were a total 210 retractions, according to Thomson Reuters Web of Science, which maintains an index of 11,600 peer-reviewed journals. He also notes, however, that there are more journals, which explains why there are more papers, in general, being published. ?So the question is whether there have been more retractions per paper published,? Oransky writes, and then points to this chart to note that were, indeed, many more. ?That?s really no surprise, given the increasing numbers of eyeballs on studies, and the introduction of plagiarism detection software. It?s unclear whether the actual amount of misconduct and legitimate error has grown; it may just be that we?re picking up on more of it,? he continues. ?What makes it difficult to tell is a problem we often see at Retraction Watch: Opaque and unhelpful retraction notices saying only ?this study was withdrawn by the authors.? How does that make for transparent science? We think journals can do a lot better, by demanding that authors and institutions come clean about what went wrong.? And why is there more fraud? As the Wall Street Journal notes, there is a lot to be gained – by both researchers and journal editors – to publish influential papers. ?The stakes are so high,? The Lancet editor Richard Horton tells the Journal. ?A single paper in Lancet and you get your chair and you get your money. It?s your passport to success.? The Retraction Watch website has recently celebrated its one-year anniversary. One thing you’ll notice is that most of the attention to retractions occurs in the medical sciences. Here is a leading question — is that because that area of research is more subject to error or fraud? It is because there is no big political movement behind it to shield them when they do bad science, for example like in climate science. There is no medical version of the IPCC or EPA or NGO’s in Medical Science. No Pachuri running around branding scientists that spot errors of practicing “voodoo science”. Basically there is no political gain to had in defending bad medical papers. I guess having electricity when you need it is sooooo last century ? UK families will have to get used to ?only using power when it was available?. That constant electricity at home was dangerous anyhow, the unending hum of the wires can drive a man so insane that the only way to cure him is to make him head of the National Grid ? Is Gore?s Missing Heat Really Hiding in the Deep Ocean? August 7th, 2011 by Roy W. Spencer, Ph. D.
NOTE: For those who are offended by my bringing up Al Gore in this post (but are apparently not offended by Gore falsely accusing scientists like me of being ?global warming deniers? ), I suggest you just focus on the evidence I present. You are invited to offer an alternative explanation for the evidence, but I will not allow you to divert attention from it through irrelevant ?copy and paste? factoids you have gathered from other scientific publications. If you persist, I will be forced to adopt the RealClimate tactic of deleting comments, which so far I have been able to avoid on this blog. We?ll just call it ?fighting fire with fire?. As I and others have pointed out, the 20th Century runs of the IPCC climate models have, in general, created more virtual warming in the last 50 years than the real climate system has warmed. You are currently browsing the The SPPI Blog blog archives for August, 2011.